Despite critics panning the 2014 Turtles, audiences still flocked to see the movie because of one thing: IT’S THE TEENAGE MUTANT NINJA TURTLES FOR GODSAKES. These are characters that non geeks and nerds love because the four Turtles have unique personalities and great chemistry together. 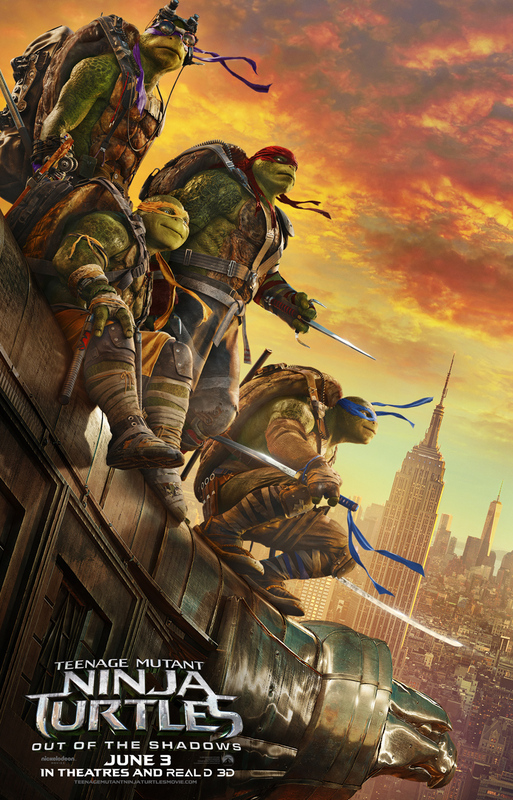 Teenage Mutant Ninja Turtles: Out of the Shadows is the newest entry in the film franchise. Yes, the critics are panning the movie but honestly their opinion shocks me because this movie is a lot better than the 2014 reboot. It might be the best Turtles movie ever. Teenage Mutant Ninja Turtles: Out of the Shadows begins with the four turtles: Leonardo, Raphael, Donatello, and Michelangelo still conceal themselves from the public eye to fight crime in the New York City. They fight during the night, and train during the day or be teenagers and do nothing. April O’Neil (Megan Fox) is there only connection to the human world. She is currently tracking Baxter Stockman (Tyler Perry), and believes he is working with the Foot Clan and Shredder (Brain Tee). Shredder has plans his own to make an army to combat and get revenge on the Turtles. Teenage Mutant Ninja Turtles: Out of the Shadows does have major flaws. The dialogue can be so over the top like “I am going to be a detective someday” as Casey Jones yells when he gets suspended from the force. He also taunts Shredder in the movie. Who taunts Shredder? Seriously, major plot hole, the Shredder is the most dangerous person on the planet and could kill Casey in a heartbeat. Shredder is a throw away character. He literally does nothing. Krang is god awful. He doesn’t do much either. The positives outweigh the negatives. The main positive are the Turtles and their chemistry. They make the movie fun because of their personalities. The Turtles have to deal with conflicts within the team. The additions of Rocksteady, Bebop, and Baxter Stockman are another positives. Rocksteady and Bebop are formidable foes against the Turtles. They do fight once, and the winner is not who you expect. Stockman is portrayed accurately by Perry. He’s manipulated by other’s with power like he usually is. Perry makes the scenes with him more entertaining because his commitment to the character. Teenage Mutant Ninja Turtles: Out of the Shadows isn’t a perfect movie. It’s more entertaining their X-Men: Apocalypse and Batman V. Superman. The audience walked out of the theater smiling and enjoying the movie. On a side note, I had to convince someone to go see X-Men: Apocalypse last night. Teenage Mutant Ninja Turtles: Out of the Shadows gets a 3.5 out of 5. This entry was posted in 2016 movies, Superhero films and tagged 2016 movies, April O'Neil, Baxter Stockman, Brain Tee, Casey Jones, Donatello, Krang, Leonardo, Megan Fox, Michelangelo, Raphael, Shredder, Stephen Amell, summer blockbusters, Superhero films, Teenage Mutant Ninja Turtles, Teenage Mutant Ninja Turtles (2014), Teenage Mutant Ninja Turtles: Out of the Shadows, Tyler Perry by jcoop28. Bookmark the permalink.